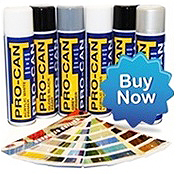 Stoving Enamel paint, ideal for use for brake calipers, brake drums, Engine Blocks. This product can withstand tempreature up to 120º. This is a single pack product and requires a Standard Thinner.